Ivoire de Balmain Eau de Toilette 100ml Spray New & Rare. New - Original Product 100% - Not a Tester. Los Envíos son “Certificados” desde Las Palmas de Gran Canaria, España. KÄUFER AUS DEN FOLGENDEN LÄNDERN. IVOIRE DE BALMAIN. PARFUM 30 ML. IVOIRE DE BALMAIN. PARFUM 15 ML. 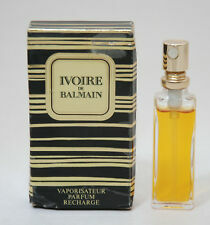 VINTAGE IVOIRE DE BALMAIN PARFUM 7.5 ml - 1/4 OZ. IVOIRE DE BALMAIN. SRRAY REFILL. PARFUM 7,5 ML. NOMBRE:IVOIRE DE BALMAIN. FIRMA: PIERRE BALMAIN. VARIANTE:EAU DE TOILETTE. FORMATO:100ML (contenido actual el de la imagen). PIERRE BALMAIN. EAU D'IVOIRE. EAU DE TOILETTE. Todos los productos que vendemos son originales. Si adquieres varios artículos con diferentes gastos de envío señalados, se abonará siempre sólo el superior. EAU DE PARFUM VAPORISATEUR 100 ML. CE PARFUM EST ORIGINAL ET PLEIN. EAU DE TOILETTE 75 ML. EAU D'IVOIRE. Balmain Ivoire de Balmain for Women 100 ml Eau De Toilette Spray. Ivoire de Balmain by Pierre Balmain is a chypre floral fragrance for women. Ivoire de Balmain was launched in 1980. Top notes are aldehydes, chamomile, asafoetida, mandarin orange, violet, artemisia, marigold, bergamot and lemon; middle notes are nutmeg, carnation, cinnamon, narcissus, pepper, orris root, jasmine, Turkish rose, neroli, ylang-ylang and lily-of-the-valley; base notes are sandalwood, tonka bean, amber, patchouli, musk, raspberry, vanilla, oakmoss, vetiver and incense. Ivoire de Balmain - Eau De Toilette 100ml New. Condition is New. Dispatched with Royal Mail 1st Class. BALMAIN EAU D'IVOIRE. 100ML EAU DE TOILETTE SPRAY. Hares & Graces was founded in 2015. Eau d'Avorio da Pierre Balmain è un profumo fruttato, floreale per le donne. Eau d'Avorio è stato lanciato nel 2000. Il naso dietro a questo profumo è Daniel Hoffmann. The nose behind this fragrance is Daniel Hoffmann. Balmain Eau D'Ivoire Balmain - 100ml Eau De Toilette Spray. 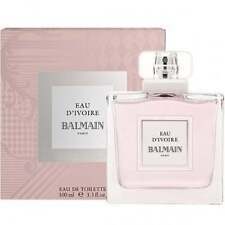 Balmain Eau D'Ivoire Balmain - Fragrance starts of with fresh fruits, delicate flowers and chypre base. The opening scent includes bergamot and red currant. Leaving a trail of Osmanthus blossom and magnolia. Ohne Folie ! Aufgrund der neuen Rechtslage (EU-Recht) ist dieser Hinweis leider erforderlich. de Balmain. Eau de Toilette. Duft wurde kühl, im Dunkeln gelagert. Balmain Eau D'Ivoire Balmain entwines a fresh floral aroma with a citrus fruit punch. The creamy chypre and musk ambrettolide base lays the perfect foundation for the Osmanthus blossom, magnolia and patchouli to float elegantly throughout the scent. 100ml Eau de Toilette Vaporisateur. EAU D´IVOIRE. NEUF sous BLISTER. Balmain Ivoire EdT Eau D'Ivoire Eau de Toilette S 100 ml NEU & OVP. Kopfnote: Galbanum, Mandarine, Veilchenblatt. Pierre Balmain - Miss Balmain. PIERRE BALMAIN . Pierre Balmain - Ivoire. Pierre Balmain - Vent Vert. ( Micro Mini ) Eau de Toilette 2 ml ?. ( Micro Mini ) Parfum 2 ml ?. Eau de Toilette 7.5 ml. Eau de Toilette 4 ml. 50ml Eau de Parfum Spray. Rufen Sie uns an!
" IVOIRE DE BALMAIN ". PIERRE BALMAIN. Ivoire de Balmain was launched in 1980. Top notes are aldehydes. Ivoire de Balmain was. Low Startthis Beautiful & Rare Eau De Toilette "Ivoire De Balmain" by. PIERRE BALMAIN. 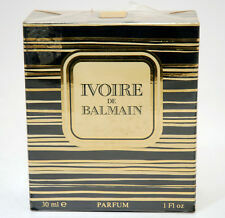 Ivoire De Balmain EDT 100 ml / 3.4 fl oz SEALED-ORIGINAL-VERY RARE . Marc Jacobs Honey EDP Spray 50 ml. Dior Diorshow Farbe Eyeshadow Lidschatten verschieden 20,30,40 081 Aventure. EUR 29,90 Sofort Kauf. EUR 99,90 Sofort Kauf. EUR 59,00 Sofort Kauf. DAVIDOFF 100ML ECHO AFTER SHAVE lotion. New full bottle as shown. New Original Pierre Balmain Ivoire De Balmain Women's Eau de Toilette 50 ml. 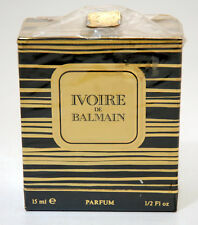 Discontinued Very Rare Pierre Balmain Ivoire De Balmain 1.7 FL.OZ. Sealed box. Ivoire de Balmain. Diese Kosten sind vom Käufer zu tragen. Das wären Verstöße gegen internationales Handelsrecht. wie auf dem Foto abgebildet! Ivoire de Balmain. Diese Kosten sind vom Käufer zu tragen. Das wären Verstöße gegen internationales Handelsrecht. wie auf den Fotos abgebildet! 7,5 ml Parfum Atomiseur. Diese Kosten sind vom Käufer zu tragen. Das wären Verstöße gegen internationales Handelsrecht. Ivoire de Balmain. wie auf den Fotos abgebildet! Eau de Toilette. Size: 2 ml / 0.07 oz. We will make every attempt possible to resolve the issue if we made a mistake. (It happens). Let us know if our service could be better! If there is a problem, we can work together to resolve the problem. Ivoire de Balmain. Das wären Verstöße gegen internationales Handelsrecht. Diese Kosten sind vom Käufer. zu tragen. wie auf dem Foto abgebildet! 3.4 FL oz / 100 ML Eau De Toilette Spray. Item In BoxLess Filled In Box About 65% Full. 3.4 FL oz / 100 ML Eau De Toilette Spray. Item In BoxLess Filled In Box About 30% Full.